Above: remains of a mural tower marking the former entrance to the castle. As has been mentioned so many times before it is virtually impossible to date any castle remains with a great deal of accuracy. All that can really be done is to suggest plausible chronologies. At Castell Dinas there does not seem to be any doubt that the masonry construction of the castle occurred early in the Norman period. 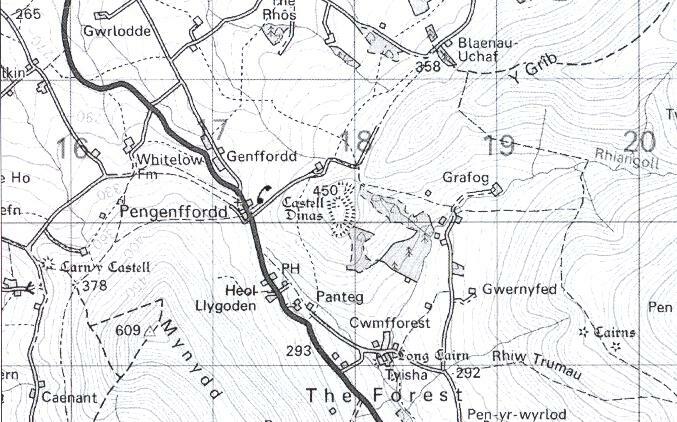 Indeed I would go so far as to suggest that its building would fit easiest into the period of conquest by William fitz Osbern in his campaign in Brycheiniog in the summer of 1070 and expansion by his son in the period 1071 to 1075. 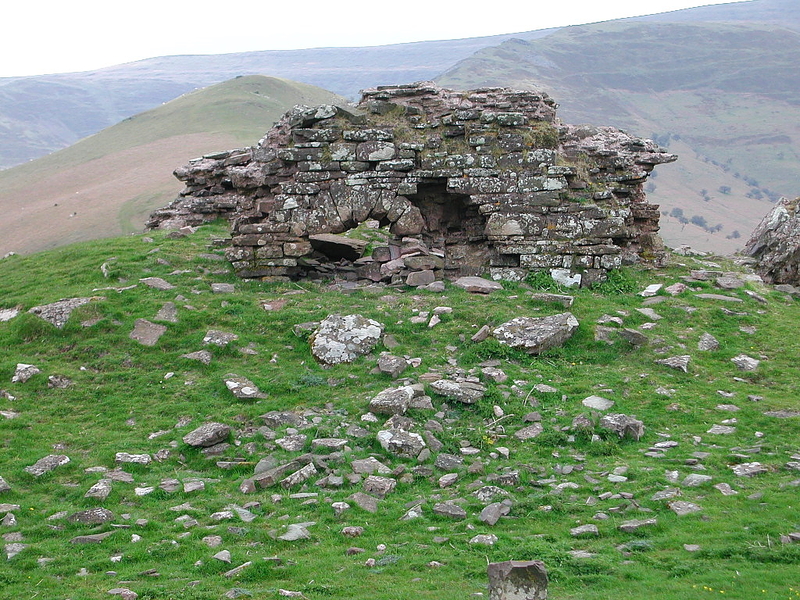 The castle would to an extent then have become obsolete with the building of Brecon Castle, the new fortress of Brecknock, in 1093. 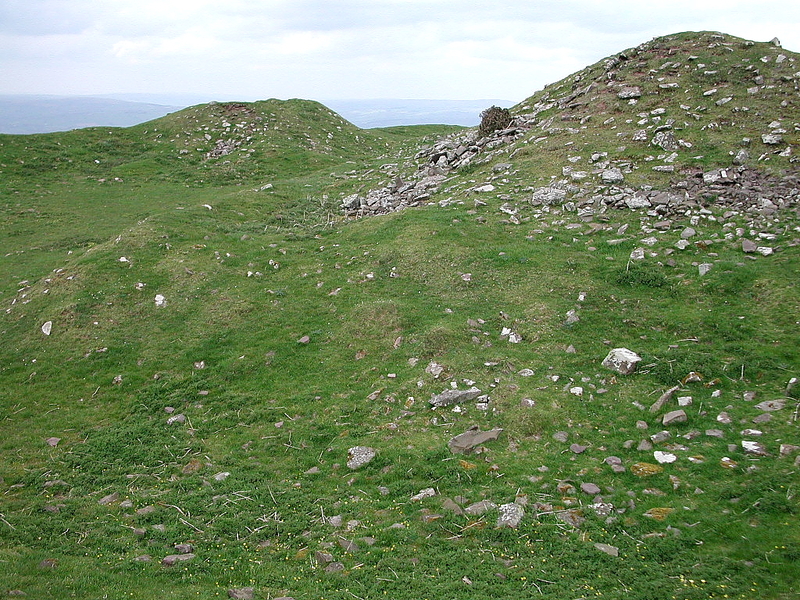 Below: ruins of the keep seen from the northern gate tower and across the upper bailey. Below: view of the upper bailey north from the area of the keep. 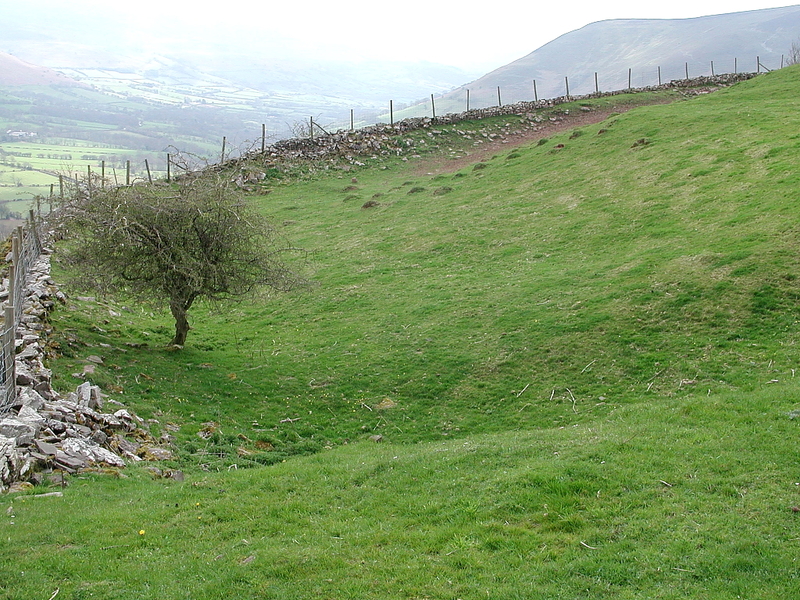 The site of Dinas keep is today marked by the huge pile of grass grown rubble which overlies the masonry remains of this once proud structure. 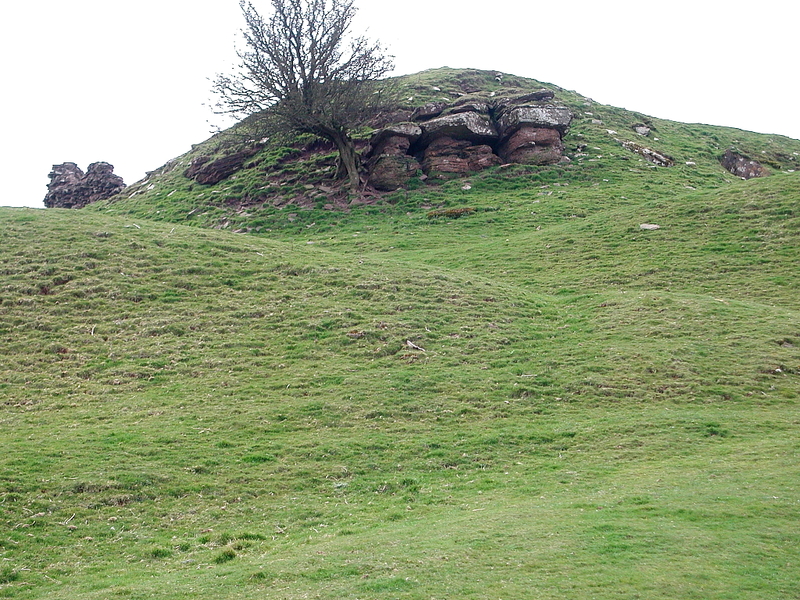 The mound of debris is about 5 metres high and seems to indicate a masonry hall keep about 22 metres by 14 metres externally. 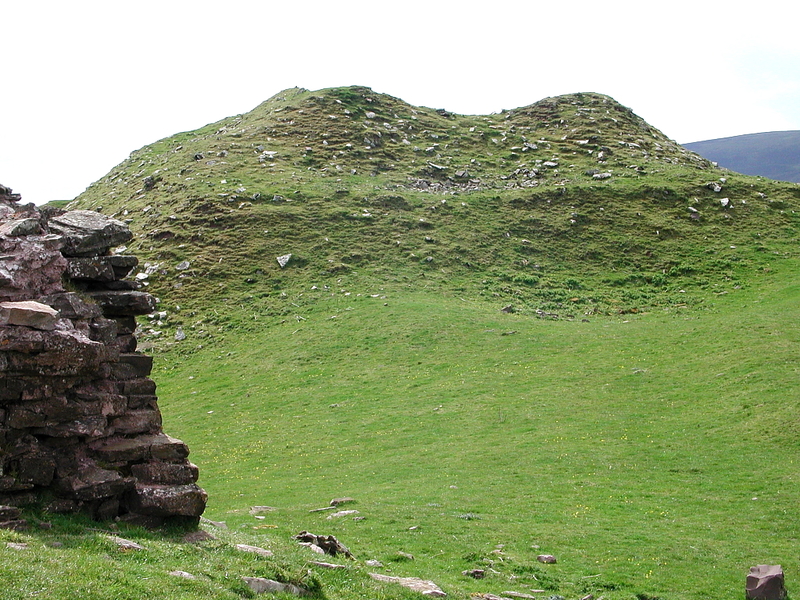 Until recently the wall of this tower, uncovered by an unofficial excavation made before 1950, protruded through the rubble at the south west corner. Surrounding the ruin of this great tower was a further wall, or chemise which was about 34 by 26 metres. Again the tentative excavations of many years ago had uncovered the face of this wall. Unfortunately there is no reliable evidence as to the thickness of the keep walls, but these must have been 2 metres thick or more if the structure was over 2 storeys high. 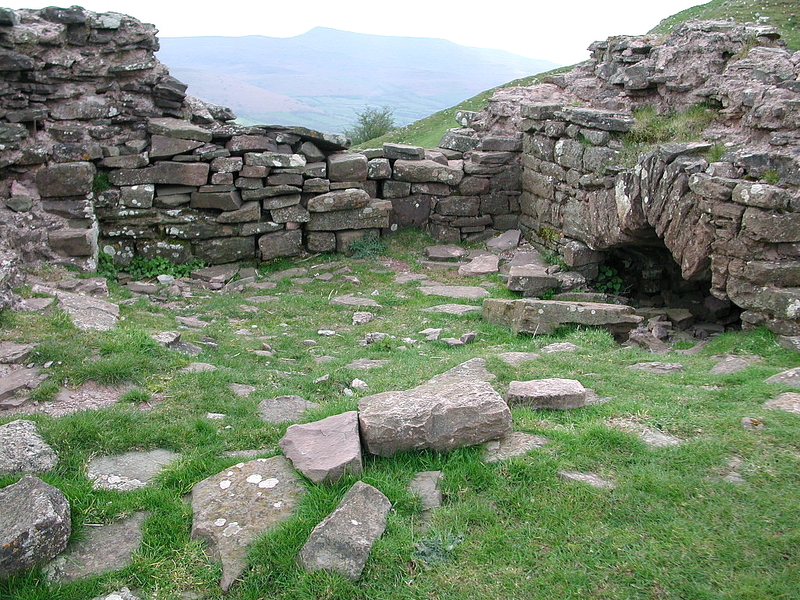 The photograph shows the ruins of the keep from the north.